When a diagnosis of cancer is delivered to a patient, the effect is obviously traumatic. This trauma is not self-limiting. The people who love and care for those with cancer have their lives irrevocably impacted, as well. Individuals find themselves in a role they hadn’t anticipated playing: that of caregiver to a seriously ill family member. Often demanding, this role rarely remains within the boundaries of prior comfort levels. Acknowledge the new normal. It can be scary to accept a role as caregiver to a family member whom you’ve only ever known as a capable flourishing human being. It’s important to acknowledge that each day there may be new challenges, be they physical, emotional or otherwise. It’s vital that you acknowledge as a caregiver that it is not your job to solve every problem. It is a good idea, however, to remain sensitive to the challenges and the emotions, acknowledge them and provide assistance where possible. You may not always know what to do, but an adjustment period is to be expected in this is a new role. The atmosphere of your home, your relationships and finances may likely be refined and change during the course of cancer treatment. Have a network of trusted allies. Frequently, caregivers can convince themselves that they are solely responsible for every need of the one for whom they care. Certainly, doing things for your loved one is a commitment worth making, but it is wise to be sure that you have some trusted helpers who can step in when you need a break or simply aren’t able to do the task required. Such family members or friends must be reliable and understanding of the patient’s needs and limitations. These allies must feel safe to both the caregiver and the cancer patient. It is therefore wise to include the patient whenever possible in choosing whom to include in your network. Any proxy must fully understand their task and be willing to be a supportive part of the patient’s care plan. Having people who can help will allow you, the primary, some autonomy and latitude in a role that often puts your own needs second. Take care of yourself. Be sure you are taking enough time to do the things for yourself which need doing. Go to the doctor. See your dentist. Visit an oncology social worker to help you with any emotional strain your role as a caregiver may place on you. Eat well, sleep enough, attend your chosen house of worship and when needs be, ask for help. Avail yourself of resources like the National Alliance for Caregiving, Caregiver Action Network and AARP which provide caregivers with education and support. You are an essential part of your loved one’s fight to conquer cancer, so be good to yourself. The benefits thereof mean you will be your best self and the best caregiver for your family member. Allow for thanks and acknowledgment of the good you are doing. 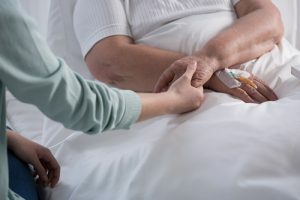 Contrary to popular opinion, a study by the American Journal of Epidemiology of more than 3,500 caregivers over six years discovered that those caring for chronically ill loved ones did not necessarily experience increased health risks. Rather, they were found to have increased their life expectancy. Know what it means to effectively communicate with doctors. As a caregiver, it is imperative that you nurture a functional and open line of communication with your loved one’s medical team. Attend appointments as often as is practical. Be sure to have the conversation in front of your loved one with the doctor present that affirms you are the trusted proxy and are to be included in major decisions. Do your best to be open when doctors suggest new courses of treatment and technologies. Don’t hesitate to ask the hard questions, and be persistent in making sure the doctor explains any new ideas or therapies to you in a manner which you can understand and easily share with your loved one if concerns should arise. Keep medical documentation organized for easy access and referral. The role of caregiver is an incredible and self-sacrificial gift to a loved one. Joining them on the journey and struggle with cancer will give you the ability to love them in both the best and most difficult of circumstances. The cancer community would not be whole without your love and support. For more tips on how to care for yourself as you support family members fighting cancer, visit http://caregiveraction.org/sites/default/files/10 Tips for Family Caregivers.pdf.